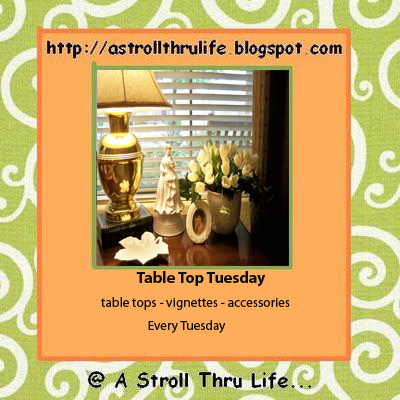 Welcome to the 57th Table Top Tuesday. I am thrilled that so many of you are joining in on the fun each week. I hope you will forgive me, I try to make the rounds and visit all of you, however sometimes time and real life doesn't allow that. I will make every effort to visit as many as possible. You guys always inspire me with how creative you are. Remember a while back I showed you how I took this white tray and changed it with a little paint and stain? With anything new, then of course we have to have a new vignette. The kitchen corner was the perfect place. This is the vignette I had there. Some things stayed and a few other things were brought in. I love this wine bottle carrier. The rooster print is one of my favorites also. I think the tray is so much better with the French Chocolate label. Love it. The old pitcher that I painted the same yellow/gold color as the tray fits in nicely. Bright and cheery for a little spring look. The Graphics Fairy has so many wonderful things to print out. You might find something that you like also. I am joining the following parties"
Your home is so beautiful! You always inspire me with your vignettes! Love what you did with the white tray! 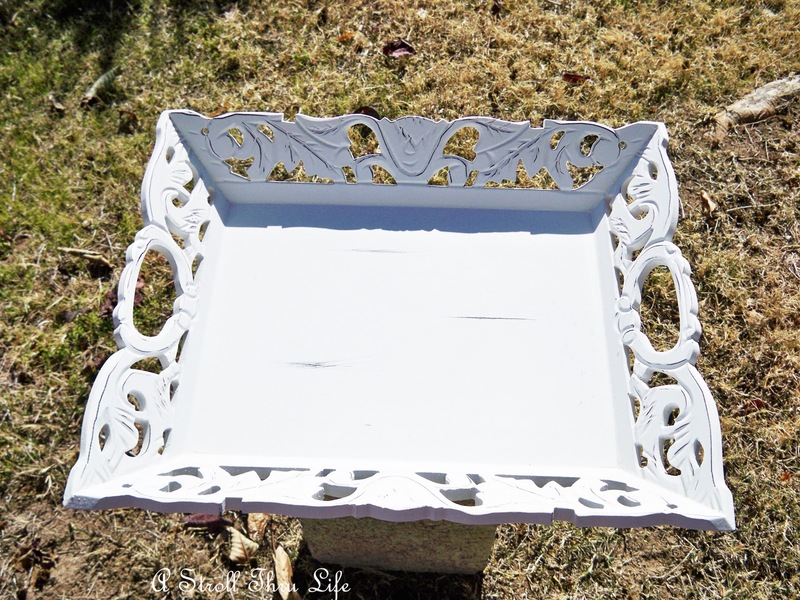 I love white trays but you changed it up so beautifully and it looks fabulous with your decor! Thanks so much for hosting yet another wonderful party and Happy Spring to you. Your vignette is awesome! The tray couldn't be any more in tune with your style. It looks fabulous! Thanks for hosting this party for us each week. Marty, Your tray turned out wonderful what a GREAT IDEA!! It also looks great with the vignette you've created! Wow, how precious is the tray Marty! This may just be my most favorite thing you have ever shown us. Gorgeous! Thank you for hosting such a wonderful party each week. I love it! Marty, that tray is tres chic!! The tray looks so pretty...you did a great job. One of these days I will get over to The Graphics Fairy! Oh wow Marty, you are so creative!! Love how the tray turned out. What a great idea for the tray!! And such a lovely vignette you created with it!! Marty, what a fabulous tray!! I always love how you put together things in such a clever way! You are the vignette master! Love what you did to the tray! Darling! Oh I adore the Graphics Fairy! Your tray looks so good and I love the new vignette! Hope to get my Easter decor out and play along next week. I get to see you in 6 days~ woo hoo! Excellent job with the tray! 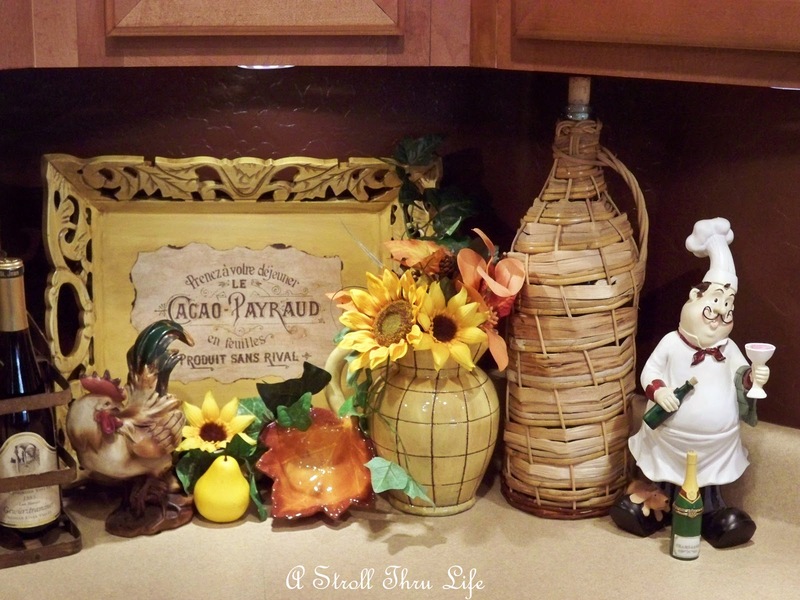 The label was the perfect choice for it, and I burst of color it brings to the vignette...a little bit of daffodil yellow is just right for the new season. Thanks for hosting Tabletop Tuesday! Marty, what a amazing transformation! You did a great job on the tray Marty! It turned out fabulous! The French label is perfect for your tray, Marty! I love the look! I love your vignette. Looking forward to reading/seeing how you put the Graphic Fairy label on your tray. Thanks for hosting! Have a SUPERB week! I love your new tray, my friend! Ohhh...the antique finish that you did is sooo pretty and of course the french chocolate label is the icing on the cake for me!!! There are so many pretty art prints over at the Graphic Fairy's place. Love this french chocolate label!!! I also love how you painted the little pitcher yellow! My friend, you are sooo good at changing pottery pieces! This looks gorgeous with your new tray and vignette! Another fabulous kitchen vignette!!! Marty, I stand in awe of you! I would have run out of ideas for vignettes a long time ago...and yet...you create a new one for us each week! You always inspire me, dear friend! How are you doing, Marty? Are you catching up after your trip to Oregon? I was also wondering how your grandson is doing??? I am continuing to pray for his quick recovery! Well sweet friend, do take care and thank you again for hosting this fabulous Table Top party! I sooo enjoy participating in your party! I love your tray makeover Marti! I just love finding things on The Graphics Fairy and making something look totally different. All that stuff is so cute!great job! Beautiful tray-I don't think I saw it before. thanks for hosting. Wow girlfriend! That looks wonderful! I love the soft yellow too and of course your vignette is fabulous! I love your tray. I have one similar to it and never thought of adding art the the center. I just sprayed mine white. Now I can't wait to see how you did it. Marty, great tray. Lovin it! The tray looks beautiful. I am going to have to look at your back post to see how you did it. 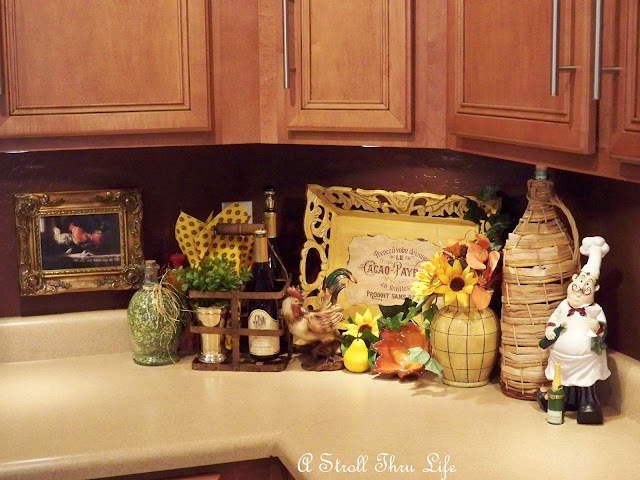 Marty, you truly always come up with the cutest kitchen vignettes! I am so hum drum and leave my as they are far too long. Linking up an old post today. Hope that's okay. 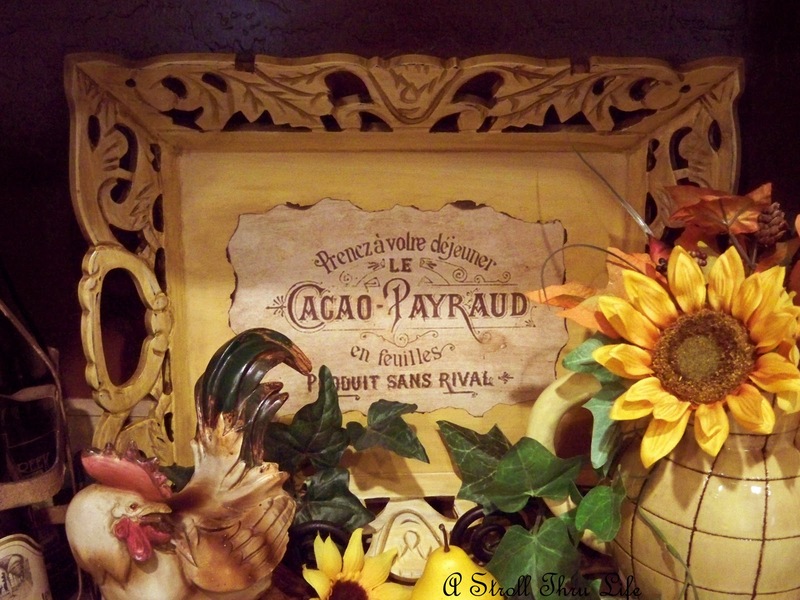 Oooh Marty ~ love your tray with the French Cocolat label. It's ooh la la magnifique!! Thanks for being our charming hostess. Ok...add that to my pile of stuff ok? That is so pretty...I love it!! I love what you did with the tray Marty. It looks wonderful. 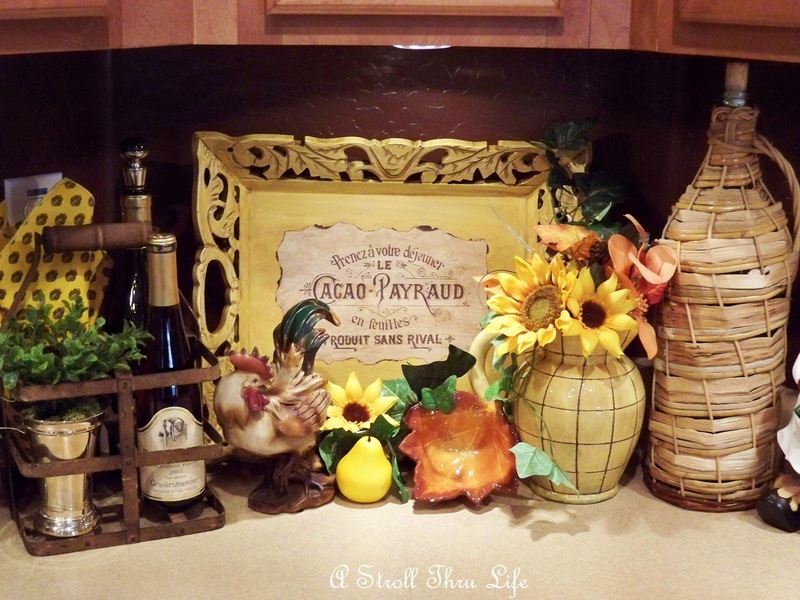 Marty, The yellow tray is so pretty and really makes your corner vignette "pop". You did a beautiful job with the painting and graphics. Love it, and love the yellow napkin in the wire holder also. Hugs. I love your vignette. The tray is awesome!! Marty, your tray is very cute. I love the Graphics Fairy. She has the cutest stuff on her site. I love that tray. You did a great job! I should be ashamed to admit that I have yet to do something using the graphics fairy. I keep meaning to check there but forget. Looks great. I'm so very happy to be joining your party this week. I've got to figure out what to do with the things at The Graphic Fairy...your tray turned out so pretty. It looks so much different than when it was white. Thanks for hosting. How is your grandson doing? I love your new tray! Great job on the redo, it looks great in your kitchen! Thanks for hosting. Hello Miss Marty, I quickly scan all your pictures for my favorite...your kitchen. I was not disappointed! There the pictures were first thing when I came by for my visit! I just love what you do in your kitchen and I haven't even tasted your cooking yet!!!!! Big smile. I know you are a great cook...I just know it! Anybody that decorates like you has to cook good! As always, you have put together a wonderful vignette! I love the tray with the French label! It looks fabulous! Graphic lettering is so chic right now. It's a great look. Your tray turned out fabulous, Marty! Thanks for the fun! It's been a while since I had a "tabletop" to show, so I haven't played, although I do lurk! 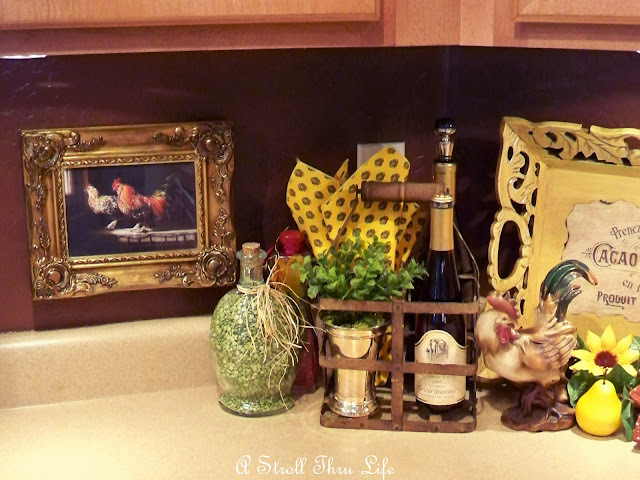 I like your "new tray, and I really like that little rooster painting hanging behind it on your backsplash. Love your new vignette. I love the graphic on the tray. It does go well with the pitcher that you did. Hi Marty! Happy TTT! Your tray turned out so pretty. Thanks for telling us about it. Have a wonderful week, and God bless. Oh Marty, I want a tray EXACTLY like this one!!! LOVE IT!!! Thank you for showing us and I'll be looking forward to learning how to make it! Wow, that tray is quite a fabulous transformation. I can't believe it. It was lovely before, but the after is amazing. You are the vignette queen that is for certain. I would never have thought to put a label like that on a tray! It turned out wonderfully and looks like it was made that way! 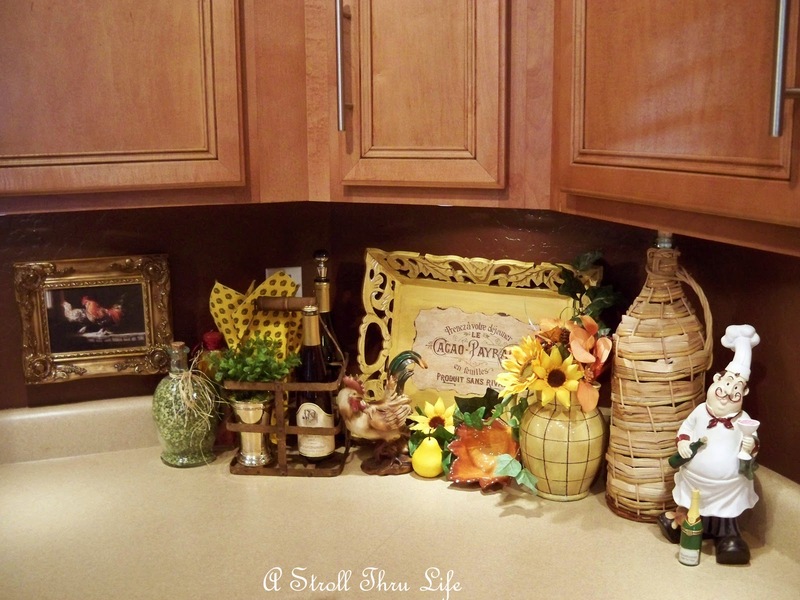 Your kitchen vignette is complimented by the terrific tray. Thanks for hosting TT! Oh, I love the redo on that white tray! I can't wait to see the tutorial on it. The vignette looks wonderful Marty! Have a wonderful week. 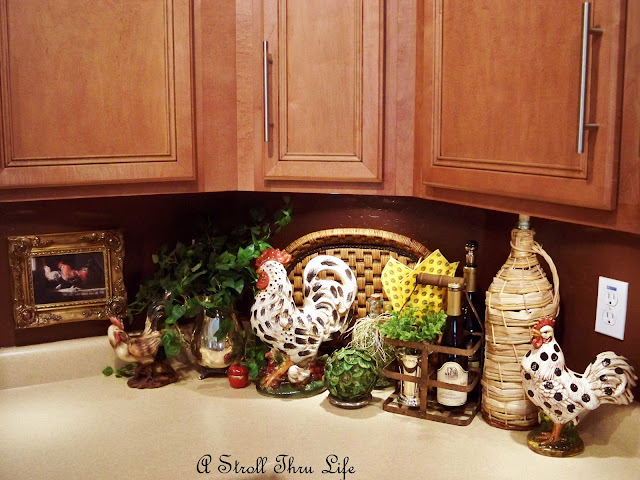 Your kitchen vignette is very nice! I'm joining up for table top tuesday. Best wishes. The tray is wonderful with the chocolate label. Ooooo, Marty....what a neat transformation! I can't wait to read all about how you accomplished this! You always come up with the neatest ideas & I'm amazed how you can change your home again & again like you do. I'm happy to be back blogging & able to join in your TTues. meme. I've missed my blogging friends! So beautiful Marty!! A lovely vignette! Come and enter my giveaway for bath & body! Your tray transformation is gorgeous! I agree that adding the label and changing the color made it a strong decor element. Your kitchen vignette is darling. I adore it too! Thank you for sharing and I'll be watching to see how it was done later in the week! You are sooo creative. I love how you repurposed that tray. But I think the winde bottle holder is my fav! One plus one (1 tray plus 1 label) equals a TEN! Job well done. The tray looks great with the label in the center. It looks perfect in that corner. You always do it up right! I like them both! But I'm like you - change is a good thing! I don't get to do it much any more. I'm looking for a Hoosier in RoundTop. I'll be thinking of you when I find it! What a beautiful tray! Love the graphics and all the detail that is highlighted with the yellow/gold paint. so so gorgeous.. Marty!! I've been missing for a while.. Hope you are doing well.. Take care! !